DERRY — Six-year-old Allison Schablein has inspired her parents and those around her since being diagnosed with a rare form of brain cancer almost two years ago. After treatment with an experimental drug, Allison has been cancer-free for 16 months, but she is still undergoing treatment and needs to be routinely checked. Even while she was enduring grueling rounds of chemotherapy, she still found the energy to dance and play in the hallways of a Boston hospital, her father Dan Schablein said Friday. Doctors were surprised to see her so exuberant during the therapy, he said. “She’s just become my hero and my inspiration; it’s incredible,” Dan Schablein said of his daughter, who is a first-grader at Grinnell Elementary School. 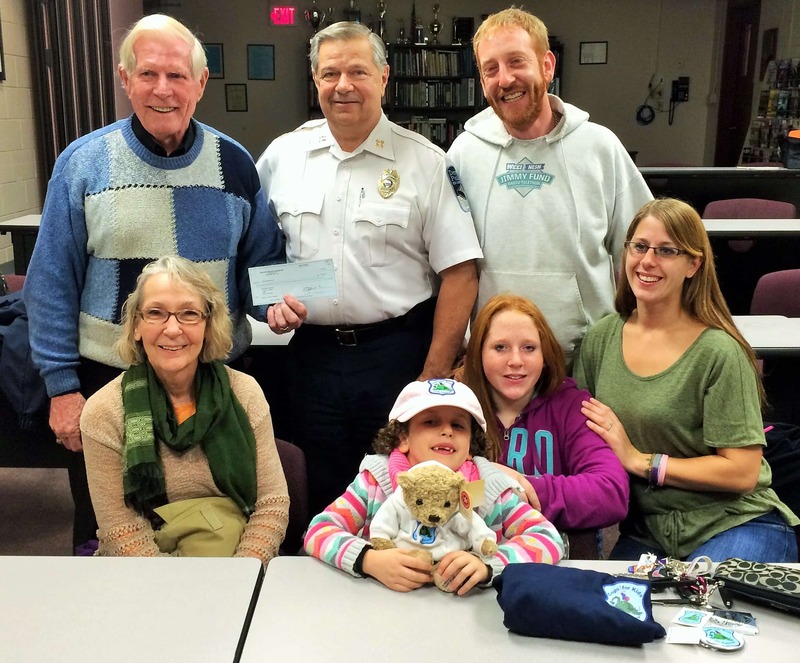 An organization, Cops for Kids with Cancer, learned of Allison’s plight and wanted to help the family. 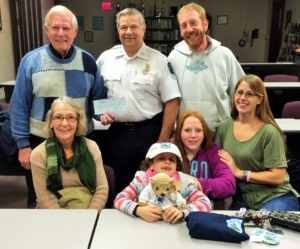 On Friday, they met at the Derry Police Department to donate a $5,000 check to the Schableins. 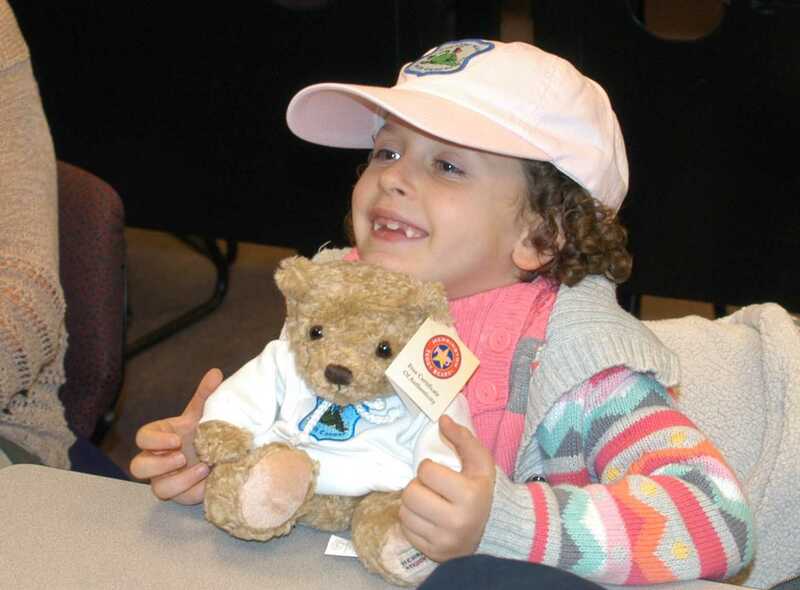 Allison’s small face beamed as Robert Faherty, chairman of the board of the not-for-profit organization, handed her a small teddy bear and other gifts. Made up of active and retired police officers, the organization regularly makes donations to children with cancer throughout New England, said Faherty, who retired as superintendent-in-chief of the Boston Police Department in 2000 after 40 years of service. While his daughter played with some of the toys nearby, Dan Schablein told of her valiant battle with the disease since she was first diagnosed in December of 2012. Before that diagnosis, she had suffered from severe migraines and frequently became nauseous. Her parents kept taking her to a doctor, to try to determine what was making her so sick. “So it was really rough for her; I felt so bad for her,” her father said. An MRI eventually showed she had stage three brain cancer, along with multiple tumors in her brain and traveling down her spine, said Dan Schablein, who was shocked when he learned of the results of the scan. “I was cooking at the time, and I just stopped; and things were really, really hard,” he said. After undergoing brain surgery, the Schableins opted to try chemotherapy for their daughter. Allison struggled bravely and held on to her sense of humor, Dan Schablein said. After her straight hair fell out during the chemo, it grew back in with a curl, and she dubbed it her “chemo hair,” he said. When the chemo treatment failed, the family was at a loss for what to do to help Allison, her father said. The cancer is extremely rare and the success rate for treating it hasn’t been high, he said. Then, they chose to try an experimental drug, her father said. Unlike the chemotherapy treatments, the medicine specifically targets the cancer, so his daughter has virtually no side effects, he said. After two months on the drug, an MRI scan showed no signs of the cancer, he said. The results of the drug have been astounding as Allison has been cancer-free for the past 16 months, her mother Michelle Schablein said. When she isn’t in elementary school, Allison enjoys such activities as dancing and fishing. The avid angler even likes to bait her own hook and dig for worms, her parents said. She also loves to do artwork and gardening. “She’s very energetic; there’s never a down moment,” Michelle Schablein said.